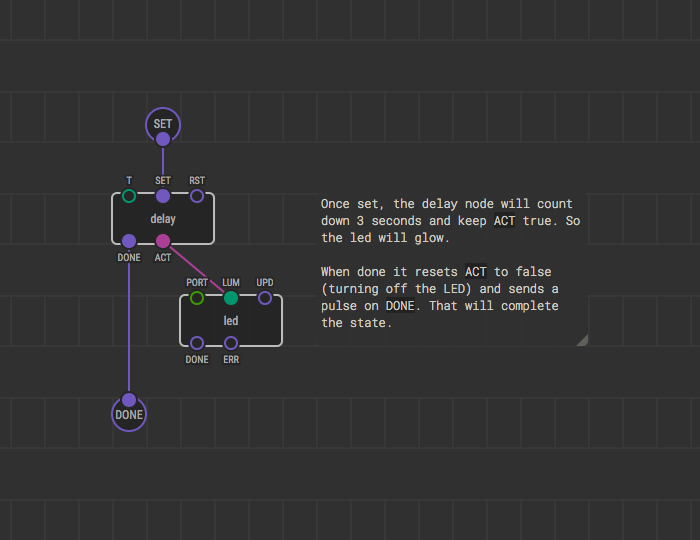 The XOD tutorial at: https://xod.io/docs/guide/simple-traffic-light/ demonstrates the creation of a node from an existing patch, and then use of the new node and management of timing in XOD. (Code has been customised by Marco Aita for our hardware). 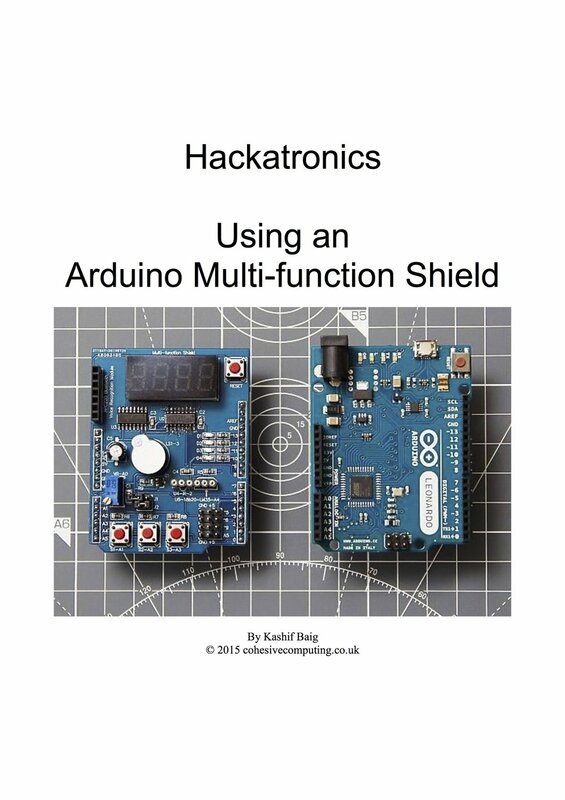 The Hackatronics section of the Cohesive Computing site (http://www.cohesivecomputing.co.uk/hackatronics/) provides an excellent source of information about this shield, along with Arduino IDE code to drive features of the board. Support for XOD, a relatively new platform, is less well developed, but growing rapidly. Our tireless Biomaker support crew have produced custom nodes and patches to help exploit the shield. 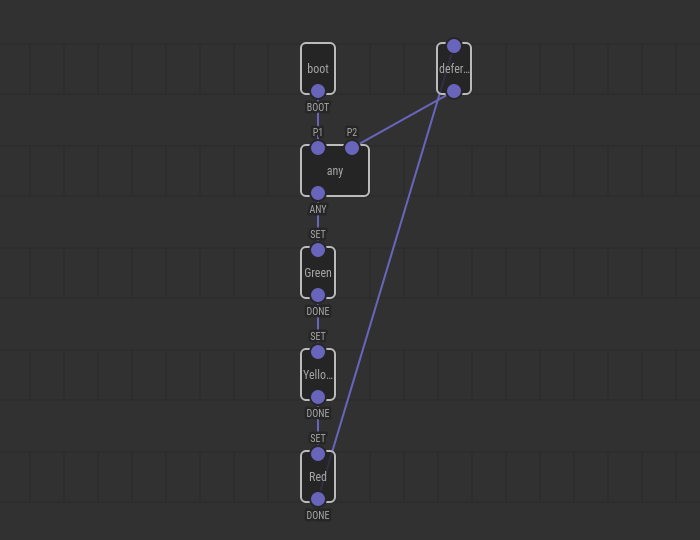 We have compiled a XOD library that contains nodes and patches that you can use to provide audible output. The buzzer on the shield can be triggered to produce timed output of defined frequency (tone). A transistor is used to control the piezo speaker (LS1) - which is activated when the output port D3 is set to zero (Unlike the buzzer on the Multi Purpose shield used in Training Session 1 & 2, there is no need to drive a oscillating signal through LS1, it is set automatically). The tutorial library for training session TWO also contains support for other components on the shield, including switches 1 (port A1), 2 (port A2) and 3 (port A3); the variable resistor (port A0) and bank of 4 red LEDS (ports D1-D4). In addition, the shield has a 4 digit 7-segment LED display. The digits are made up of seven individual LED segments, which must be controlled to form particular numbers. Controlling individual LED segments to display numerical values. The shield is wired with two 74HC595 shift register chips that each take an 8-bit serial input and decodes this to provide 8 parallel outputs. Suitable serial codes are sent to the circuit to control the display of numbers on the display. Marco Aita has wrangled code that allows the circuit to be used inside the XOD environment (with thanks to Arduino Learning). DS1307 is a low-power real-time clock chip with 56 bytes of non-volatile RAM, full BCD code clock and calendar. The address and data will be transmitted via a two-wire bidirectional serial bus, and the chip can provide information such as seconds, minutes, hours, etc., and the number of days in each month can be automatically adjusted. Besides, there is a compensation function for leap year. AM / PM flag is to determine whether the clock operates in 24-hour or 12-hour mode, and there is a built-in power-sense circuit in the chip with powering down detecting and battery switching functions. The new shield provides support for the DS18B20 digital thermometer chip. Note that Jumper one (J1) must be added to allow the sensor to work. DS18B20 digital temperature sensor adopts single-bus technology, which can effectively reduce external interference and improve the measurement accuracy. Meanwhile, it can convert the measured temperature directly into a serial digital signal for computer to process. With simple interface, it makes data transmission and processing much easier. 1-Wire and I2C are true shared-bus protocols - you can have 100+ components all talking at once using the same 2 wires (for I2C) or a single for 1-Wire. 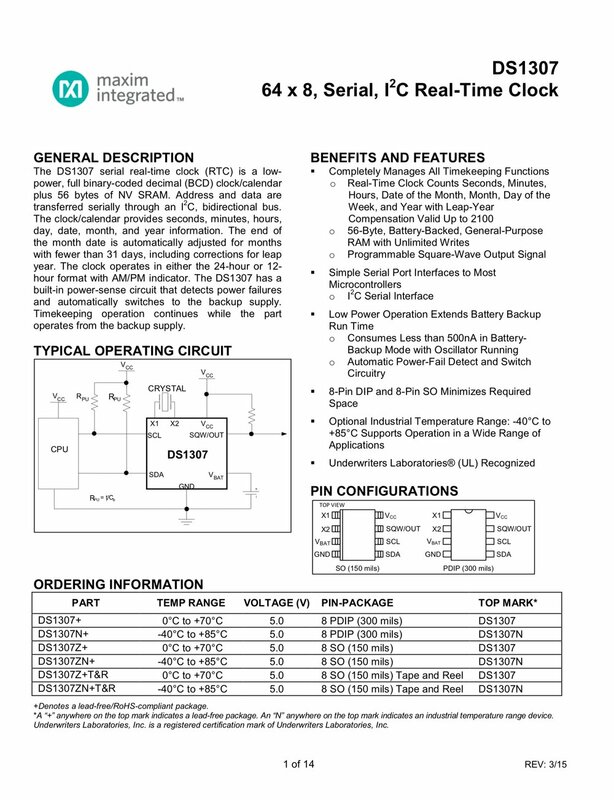 I2C (Inter-Integrated Circuit) is a faster and more open standard, and many sophisticated (and often cheap) digital devices are available for connection. XOD provides a series of I2C primitives that can be combined to create custom patches and nodes. Connecting the GND (black), A4 data (yellow) and VCC 5V (red) wires of the DS18B20 device to the multi function shield.